Think a chiropractor just cracks your back and sends you on your way? Not true. A chiropractor’s goal is to not only to relieve pain but to keep you pain-free between adjustments. The spinal manipulations used to correct sublaxations (misalignments) of the spine can relieve painful pressure in your neck, back and head, but chiropractors know that to maintain wellness, you should follow these simple tips to keep your back and neck aligned and reduce muscle or nerve pain. How you start your day can help determine how much your lower back complains by the end of it. Before you even get out of bed, Barbara Rosinsky uses these 10 tips—from cutting out sit ups to uncrossing your legs—to keep you free of back or neck pain between visits. Yes, strong abdominals are key to reducing pain in your back. But if you have back pain, traditional crunches and sit-ups actually make the pain worse, says Andrew Bang, D.C., of the Center for Integrative Medicine at The Cleveland Clinic. Instead, hold yourself in a yoga plank pose—lie on your stomach and then lift your body so you’re balancing on your hands and your toes, like a push up. Hold the position as long as you can, increasing the time with each attempt. Side planks will also firm up your core. From the plank position, rotate your body to the left so you are balancing on your outstretched left arm and on your left foot (either stack your right foot on top of your left or place your right foot down if it's necessary for balance). Reach your right arm upward. Hold it as long as you can and then switch sides. “I have more low back pain patients who sit at desk all day than are manual laborers,” says Dr. Bang. Our hamstrings get locked up from spending so many hours sitting in a chair, says Bang. “So when we try to stand up from sitting, our hamstrings pull on our pelvis, causing misalignments in the spine and all kinds of pain." But a few simple stretches can counter this effect. While lying on your back, wrap a yoga belt around your foot and pull your leg up, keeping it straight. Feel the stretch along the back of your leg. Then try to stretch your leg across the groin—over the left leg to right and vice versa—and then out and away from your body towards your hips and. Work yourself up to holding the stretches for 90 seconds. Take a look at your phone. Notice what you just did? In all likelihood your chin went to your chest and your neck curved into a C-shape. That’s majorly bad for your neck, says Bang. “There’s 12-15 pounds of weight in the human head,” he says. “The further the head is away from our shoulders looking down at our smartphones, [the more it] strains the muscles. The bones and the discs start to mash together and you get pain.” This goes for all handheld electronics, like iPads. To save your neck, prop up your arms so you’re looking at your phone straight on. If you’re using an e-reader in bed, hold it up on your bent knees instead of down on your lap. Despite our best efforts, many of us spend our days staring at screens, our necks craned downwards. Use your drive time to release some of the tension you build up in your neck, says Bang. While you’re driving, lean your head back against the headrest. Doing so will naturally raise your chin to a comfortable position and take some of the pressure off of your neck muscles, giving them a needed rest. You can get the same release by placing your hands behind your head and gently pushing your head toward your hands. Belly snoozing is the worst position to sleep in, says Rosinsky. “You have to turn your head to the left or right, and that creates neck strain,” she says. Instead, either sleep on your back with pillows under your knees or on your side with pillows between your knees. Both positions help maintain the spine’s natural curvature. “In both positions, sleep with a small pillow under your head and pull the pillow down so it’s also supporting your neck,” says Rosinsky. This is going to be a hard one. If you sit at a desk all day, make sure your feet are parallel and planted firmly on the ground, says Rosinsky. If your feet don’t reach the ground, use a box or foot rest to prop them up. This will reduce pressure on your lower back. Also raise your computer screen so it’s at eye level to limit neck strain. 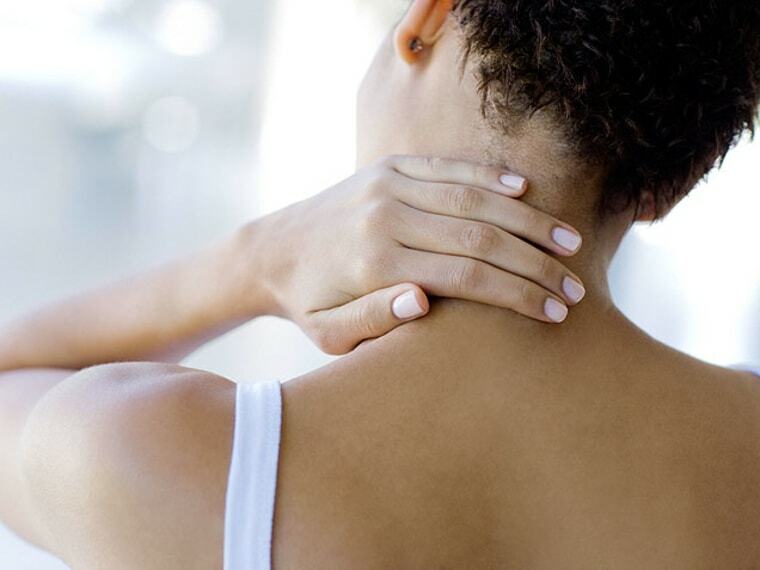 If you’re plagued by headaches, see a massage therapist to relieve tension in your shoulders, neck and jaw. Tight muscles in these areas might be the source of your pain. If you grind or clench your teeth at night, you could be putting too much stress on the temporomandibular (TMJ) joint in your jaw. A night guard, available over-the-counter or from your dentist, could ease your headaches. When your grandmother scolded you about slouching, she was doing more than trying to make you look better. She was likely saving you from a backache. “Sit up on your sit bones, not back on the sacrum,” says Rosinsky, referring to the “fleshier” part of your tush. Think about the curve in your lower back and try to preserve it as you sit. “And whatever you’re working on, your keyboard and your computer screen should be square with your body.” So don’t put your laptop on your lap and hunch over it. You’re much better off putting it on a table. All of these strategies can help you stave off pain, but chiropractors also recommend regular adjustments that can help keep the spine aligned, the nervous system functioning properly and reduce the risk of recurring pain. “Seeing your chiropractor on a regular basis, whether you’re in pain or not, will help you maintain your balance and your range of motion,” says Bang. Follow NYC-based health and wellness writer Cynthia Ramnarace on Google+, Twitter and her website.